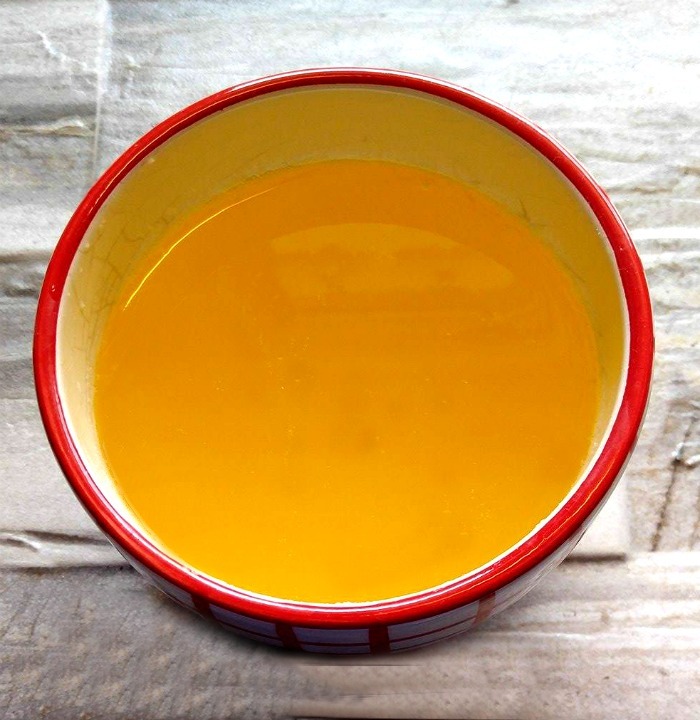 Clarified Butter Recipe – Separate Those Milk Solids From Butter Fat! 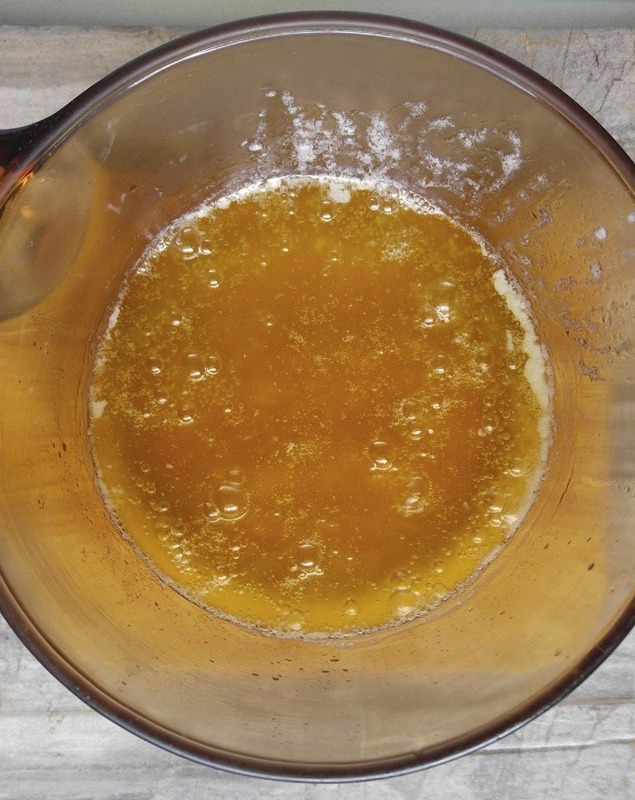 I have been using clarified butter in many of my recipes lately and love it. It has a much higher smoke point that normal butter does. If you have tried to fry anything in normal butter, you will know how easily it is to burn. 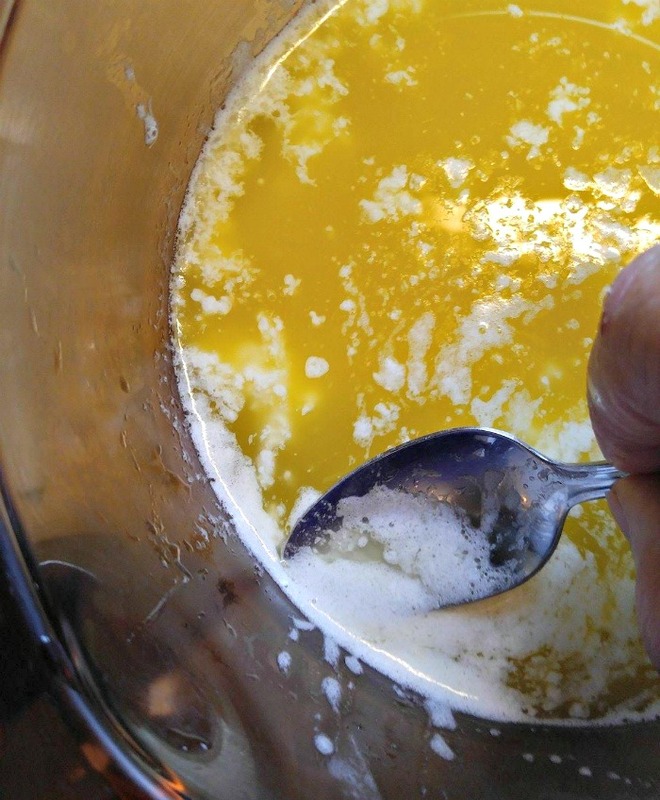 Knowing how to make clarified butter is one of my most often used cooking tips. Basically, clarified butter is butter that has had the milk solids and water removed from it. It’s super easy to do. You just melt the butter and allow the solids to float to the surface and then skim them off and strain the mixture. This leaves you will pure butter fat that can be stored for ages, and has a smoke point of 450 º F.
Using clarified butter is just one of my tips for eating clean on a Paleo and Whole30 diet plan. Be sure to check out my Paleo baking tips here. I’ve been following the Whole30 plan for the last few weeks. If you haven’t heard of this, it’s a very strict eating plan which is meant to get rid of inflammation in the body by removing wheat products, legumes, alcohol, sugar and dairy. After 30 days, you reintroduce these foods to see how your body reacts to them. I’ve noticed a huge improvement as far as joint pain, skin issues and many other areas and would recommend the program to anyone who wishes to find out how diet impacts them physically. Clarified butter (and its cousin ghee) is a staple on the Whole30 diet, so I have made it several times with this method. It is great for sauteing and frying, makes a mean dish of spinach and mushrooms, and is perfect for making eggs and cooking steak and other proteins. Start by adding your butter to a saucepan over medium low heat. Be careful not to have the heat turned too high, or you will end up with browned butter. I also use unsalted butter for my clarified butter recipe and use four sticks of butter. As the butter starts to melt, you will see it pop and bubble slightly. Solids will rise to the surface in a light foam. The bubbling and popping noise means that the water is being removed from the butter. Keep heating gently as you skim these solids off the top with a spoon. You will see a nice golden layer of pure butter fat as the solids keep getting removed. The milk solids will also sink to the bottom under the pure golden butterfat. You will know that it is done when the bubbling just about stops. This means the water is gone. When you are done skimming, there will be very little visible milk solids left. Time to strain the mixture. The final step is to strain the mixture through cheesecloth to make sure that all the remaining milk solids stay out of the clarified butter. Pour the clarified butter into a container. It will easily keep 3 to 4 months since the milk solids that can make butter go rancid have been removed. It has a lovely golden color and no milk fats or water left. It can even be stored out of the fridge! You use clarified butter in much the same way as regular butter, but I save it for those foods where I really want the flavor of the butter fat to shine. It is silky, rich and has a lovely flavor but is not quite as creamy as butter. Don’t use this in baked recipes unless it is specifically called for. Most normal recipes are intending you to use regular butter and if you substitute clarified butter, the recipe could taste flat and oily. Clarified butter is Paleo, Whole30 compliant, and dairy free. 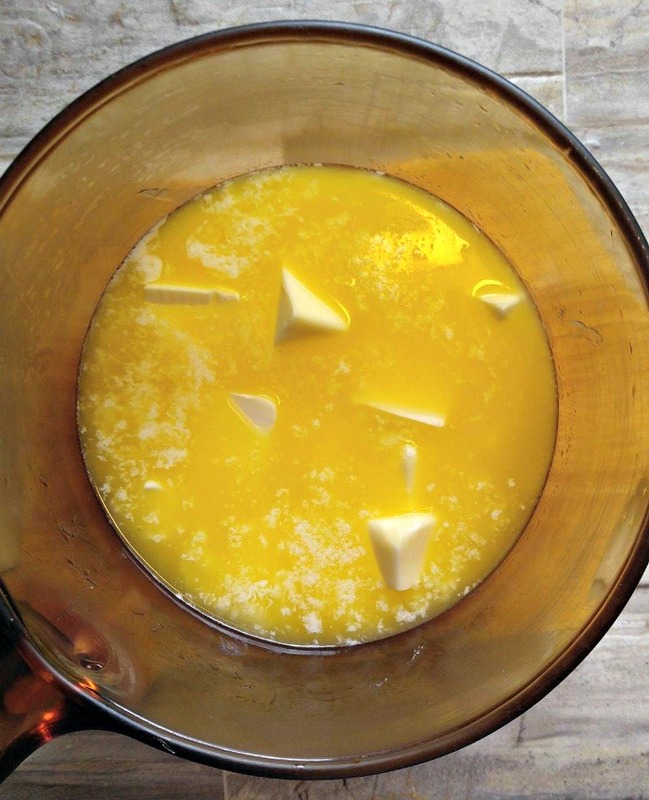 Ghee is made with a similar process, but you allow the milk solids to brown slightly before straining. This gives ghee a more nutty flavor. It is a staple of Indian cooking. 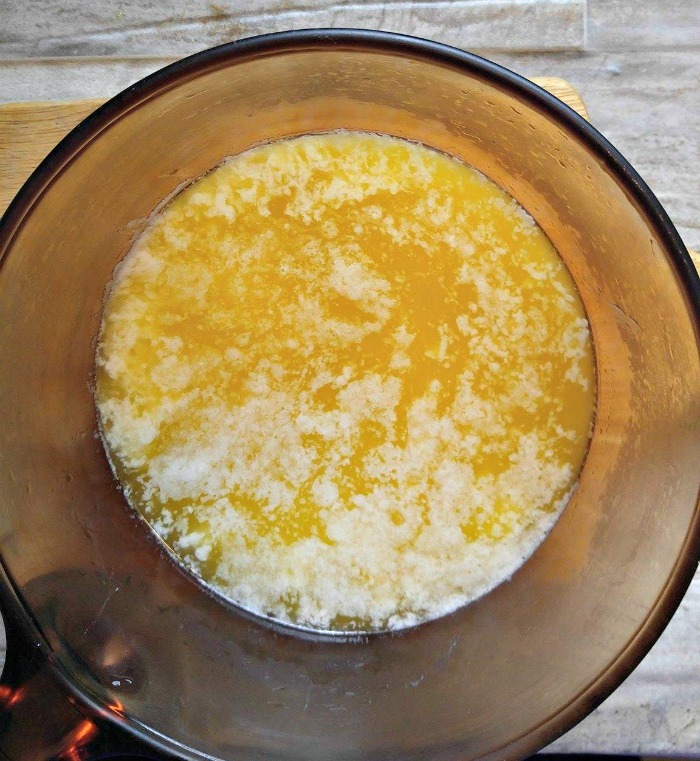 Clarified Butter Recipe - Separate Those Milk Solids From Butter Fat! Place the butter in a saucepan over medium heat and allow to cook until it starts to bubble and the milk solids rise to the surface. Scoop these off with a spoon and continue cooking until most of the solids appear to be gone. The bubbling will just about stop when the water has been mostly removed. 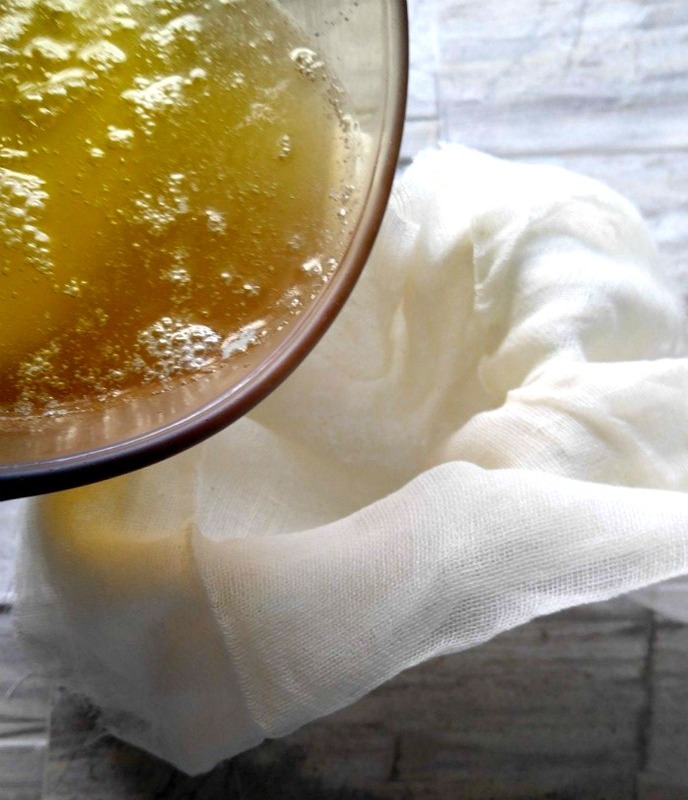 To ensure that all solids are gone, strain through cheesecloth into a container. 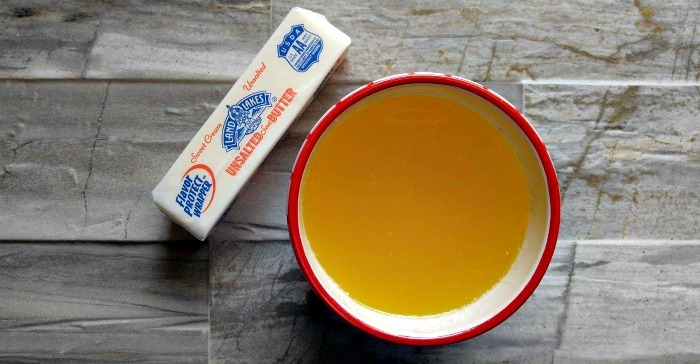 Clarified butter keeps well in the fridge for 3 to 4 months and can also be frozen.